I tried a new recipe last week that I want to share with you. Chicken Baked on Bread & Swiss Chard; adapted from the December issue of Food and Wine. I’m always looking for new, easy and healthy ways to cook chicken and this seemed to fit the bill perfectly. I did make a few changes…I used baby spinach instead of swiss chard. I omitted the capers and the raisins; one because I didn’t have them and the other because my husband doesn’t like them. And I added some chopped green olives, which I thought went very well. 1. Preheat the oven to 350°. In a large bowl, toss the bread cubes with the olive oil, capers, raisins, Swiss chard, shallots, garlic and thyme. Season with salt and black pepper. Spread the bread in a large enameled cast-iron casserole. 2. Season the chicken pieces with salt and pepper and arrange them over the bread. Cover the chicken with a piece of parchment paper and close the casserole with a heavy lid. Bake the chicken for 35 minutes. 3. Remove the lid and parchment paper and increase the oven temperature to 400°. Bake the chicken for 10 to 12 minutes longer, or until golden on top and cooked through. Remove the casserole from the oven and let stand for 5 to 10 minutes. 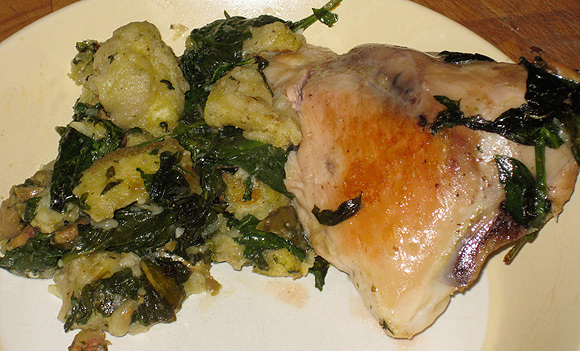 Serve the chicken with the bread and greens. The winner of the Cooking Light Way To Cook Vegetarian Cookbook is Monet from Ancedotes & Apple Cores. Congratulations to Monet and thanks to all of you who participated. Sounds good. I will probably leave in the capers and raisins because I like them. I love capers and raisins. And bread. And everything having to do with this dish. I think I need to give it a go! This baked chicken looks and sounds wonderful! I love every single ingredient. I'm so happy to have won that cookbook! Did you get my email with my address? I love new chicken recipes, and I'm excited that this uses day old bread (we have a lot of that around here!) I hope you are having a happy day. Stay warm and keep on enjoying all that is beautiful and tasty! This looks GOOD and so easy to make. Such an interesting recipe - sounds delicious! How delicious! I like the idea of cooking it on the bread. This sounds great and I like your spinach substitute. I grew chard this year and didn't use nearly enough of it. I really like it, but it is really under used around here despite it being available at our farmer's markets. I love chard, this looks like a great way to use it.